Generic and branded medicines may have different appearance due to use of different colors and excipients but both of these drugs have same active ingredients. A lot of persons have misperceptions regarding the quality of the generic and branded medicines. Generic and branded medicines both are prescribed by the doctors. Both of these medicines have the same drug but both have some difference in other ingredients. A brand name is a name given by the innovator and manufacturer of the drug with which it is recognized by the public. Branded medicines are first of their kinds, they are invented. The invention of drugs is rather long, expensive and exhaustive dealing with discovery, research, testing, development, production and marketing. For a pharmaceutical company to market and sell its product it must meet requirements and gain approval from the FDA by submitting a New Drug Application. This documentation data is to establish the drug's efficacy, quality and clinical safety. A number of studies are carried out to determine its characteristics pending approval. Upon approval, the pharmaceutical company obtains a patent as the sole manufacturer and seller of that drug. The patent allows the pharmaceutical company to sell the drug exclusively, enabling it to recoup money spent during research and development and, to generate a reasonable profit. The patent prevents other pharmaceutical companies from manufacturing and/or selling the drug without permission. Upon expiry of the patent, other companies can apply to the FDA to manufacture and sell a generic version of the drug. A generic drug is a copy of a branded medicine. According to the FDA, more than 80% of prescriptions filled in the USA are for generic brands. This number is expected to grow as more drug patents expire. Generic drug manufacturers must prove to the FDA of bio-equivalence and bio-availability for approval to make and sell generic drugs and must meet the FDA's rigorous standards with respect to identity, strength, quality, purity and potency. The main difference between Generic and Branded medicines is cost. Manufacturers of branded medicines incur the development costs associated with drug invention, manufacture and marketing. According to the Tufts Center for the Study of Drug Development, a pharmaceutical company is likely to spend more than $2 billion and a decade in developing a drug and gaining FDA approval. 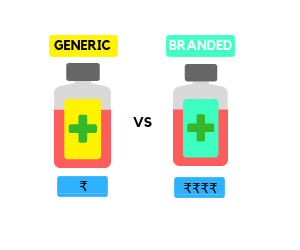 Generic medicine manufacturers cost much less than branded medicines since they do not incur development costs, just production and marketing cost. Thus, generic medicines are cheaper than branded medicines. Many generic companies are approved for same brand name drugs of a single product leading to higher competition and subsequently lower prices. In 2010 alone FDA approved generics saved $158 billion; close to $3 billion saved every week. Another difference lies in the medicine's inactive ingredients like dyes and preservatives. For FDA approval, generic medicines must contain a similar active ingredient in the branded medicine since it treats the same disease/condition. Inactive ingredients, also called excipients, may cause generic medicines to be absorbed in either a slower or faster rate than branded medicines; this causes tolerability problems in patients. Also, inactive ingredients in a generic drug may cause allergies. Other differences include an overall appearance in terms of shape, size and color but effectiveness remains similar. Also, branded medicine names are Capitalized while generic medicine names are not capitalized.